The two big items for Josie last month were talking and pooping. 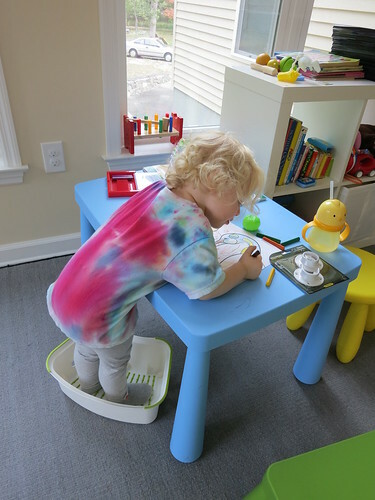 Josie has been sitting on the potty for a while most nights for weeks and weeks now, without anything to show for it. 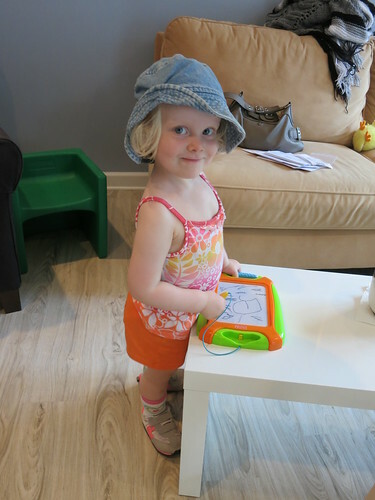 Last weekend, we decided to let her go pantsless for a while instead, and she actually used the potty a couple of times here, and then again at daycare! This is obviously super exciting news, especially since I had already given up on potty training her before the new baby comes, since I've read that that should happen about 3 months before any major change to lessen the chances of regression. That would put us at her being fully potty trained by around Thanksgiving, which just seemed really unlikely, so I just gave up early. And although it still does seem pretty unlikely, but at least we're making some progress now! Besides that, just lots more talking for this month. She now says "oh, great", but in an encouraging way rather than sarcastically - it's very supportive as she interjects that in any conversation now :) Josie also figured out her name, and while she's still "Yosie" to herself a lot of the time, she's starting to say her name correctly sometimes too. She got into a funny conversation with her giraffe where she would point to herself and yell "Yosie", then to the giraffe and yell "giraffe! 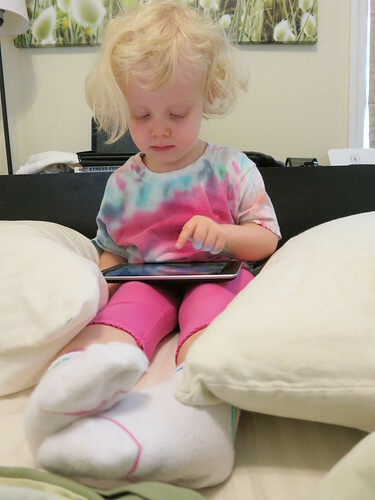 ", so at least she's worked that out now ;) She also will ask for "daddy's tablet", and once we unlock it for her (luckily she hasn't figured that out yet), she'll click on her Daniel Tiger app and will be content for as long as we let her play it. We also taught her the ever-important skill of how to cheers, which led to Josie saying "Cheers, mommy, cheers, cheers, cheers, mommy", etc., until I finally realized she was saying "cheers" instead of "cheese." So then we cheers-ed and she called me out on my glass being empty - she apparently knows the rules already. She's also doing better with saying some short sentences on her own, like when I opened the car door for her and she saw some bags in her car seat, and she said "Oh no! 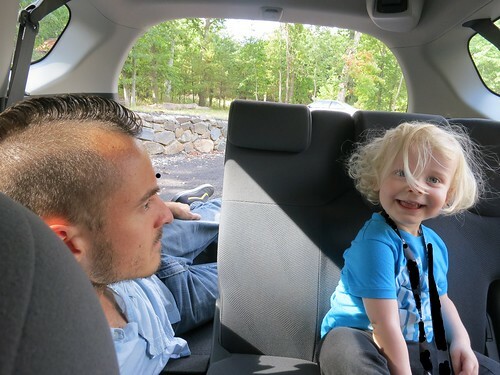 Stuff in car seat!" She also laid her head against the table the other day and then closed her eyes, so we (reasonably) asked her if she was sleeping on the table. I feel like we perhaps got a glimpse of her teenage years as she then mumbled something under her breath and then said "Not sleeping on table" before stalking off. Josie suddenly started demonstrating that her memory is developing too. Just one day after Ryan and I switched cars, she remembered whose car was whose, and that she needed to go to the opposite side of my car than usual to get in her car seat. We also were playing up in the guest room, and she ran to a corner, yelled "corner!" and then pointed me to another corner... even though we hadn't played that particular game in months.